The Trust maintains a small group of offices, commercial shop fronts and three residential lettings within Black Swan Terrace. Currently occupied by Grapevine, a charity who works to enable people with learning disabilities. Find the Weavers’ Workshop here, open every Thursday morning. 120, Upper Spon Street – Glazed Nails stunning and original nail artwork. 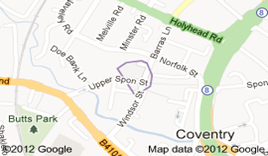 119, Upper Spon Street – Perfect Tresses specialists in spectacular hair extensions.